The application will help you to download images attached to published Google+ posts. Attached images are detected during the posts download/refresh process and made available for download. You’ll have to refresh all Google+ feeds downloaded by previous versions of the application. You can do so by clicking the Refresh button that’s next to every already downloaded Google+ feed. 1. Download / Refresh Google+ feed posts by clicking the Download or Refresh button that’s right next to every detected Google+ feed. 2. 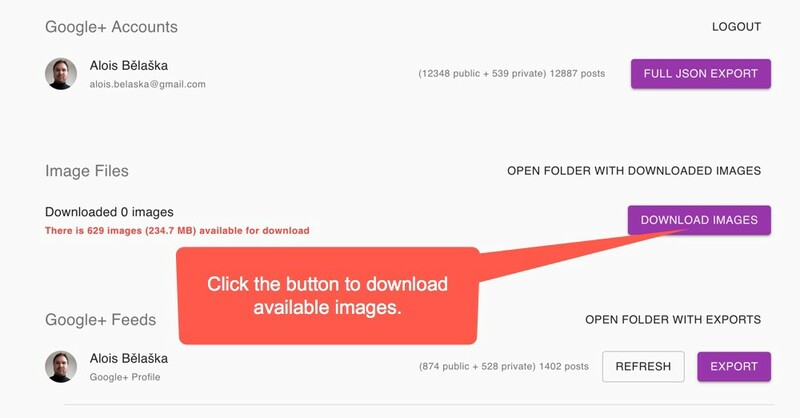 Click the Download Images button once post download/refresh process finishes. 3. Click the OPEN FOLDER WITH DOWNLOADED IMAGES button to open the folder with all downloaded images. How can I get a list of all available images? By clicking the Export List button, you’ll get google-plus-image-list.csv file with a list of all available images. The CSV file contains image URL, file name, size, and path where the image is stored on your hard drive and finally the information whether the image was already downloaded or not. Where are downloaded images stored? Click the OPEN FOLDER WITH DOWNLOADED IMAGES button to open the folder with all downloaded images. @FriendsPlusMe founder. Create or die.